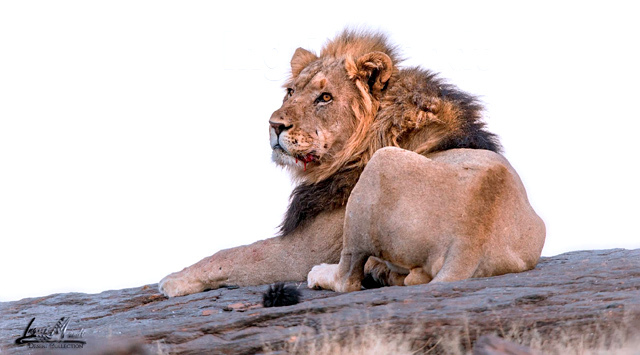 In Namibia’s far north west, within the Kaokoveld, the Floodplain pride has taken up residence. It’s a seven lion pride – 2 female adults and 5 sub-adult males are at the heart of the Desert Lion Research Project. These lions were born to a lioness ‘the Queen’ who has now passed away – she played an integral part of the population of desert lion, a very special pride! Lions are recorded as living along the Skeleton Coast and the Northern Namib Desert as early as 1934 when Shortridge confirmed that they were plentiful between the Kunene River and the lower Kuiseb River, along the coastal regions and mountains. In 1967 the Skeleton Coast was declared a Park and there are records of occasional sightings. Lions were observed in 1985 by Bridgeford, who recorded that lions on the beaches looking for food and eating cormorants and seals. Analysis from records of patrols and game counts along the Skeleton Coast taken by conservationists for the Ministry of Environment and Tourism have been made available by J Patterson, the Park Warden. This data shows that in the 22 years between 1970 and 1991 a recorded total of 477 lions were sighted during 238 observations. Namibia’s unique population of desert-adapted lions live in the Namib Desert. The country continues to receive international recognition for its conservation efforts: for example the communal conservancy program has led to wildlife numbers increasing – particularly throughout the country’s arid areas. This does cause a certain amount of conflict within the environment where the local people are having to protect their livestock from lion attacks. The communities suffer the costs of living with the lions but currently receive few benefits which tourism brings to the region. The Desert Lion Conservation project’s long term goals include management plans to develop and implement human-lion conflict within the affected communities and monitoring the impact and frequency of the conflicts. Scientific data on the movement of lions combined with research are key to regulating the population. Radio collars fitted to lions of 2 years or more to provide the necessary information for monitoring their behaviour, reproduction and mortality and movements and grouping patterns. Using GPS and satellite technology, lions are tracked by light aircraft and vehicles with particular emphasis placed on individuals which roam and move to new habitats as well as those living close to local communities. Over recent years the story of the desert lion population has unfolded. They have survived against all odds and continue to strive to exist in one of the worlds harshest environments. Today they are the fastest growing population of lion partly due to the commitment of Dr Philip Stander. His understanding and continuous monitoring of the ‘Vanishing Kings’ has been crucial to their survival. Namibia’s Desert Lion Conservation Project was started by Dr ‘Flip’ Stander in 1998. Through his research has gathered ecological data on the pride’s population dynamics, this information is shared with local communities, NGO’s and worldwide, supported by the Namibian government. Eco safaris to areas where wildlife thrives in Namibia’s wilderness plays an integral part to the future of lion conservation. The area around the Hoanib Skeleton Coast Camp is where the Floodplain pride appear to spend most of their time. Dr Philip Stander uses this area as his base for monitoring the lions. Their work in this locality has led to further predator research and as wildlife becomes more comfortable with the vehicles, there are more sighting of creatures such as the elusive Brown Hyena.